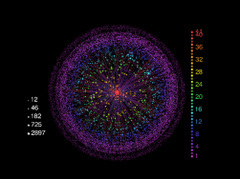 Popular Science Blog - How Many Licks Does it Take To Get to the Center of the Internet? How Many Licks Does it Take To Get to the Center of the Internet? The Internet may be referred to as the "information superhighway," but a better analogy might be an enormous, hulking Tootsie Roll pop. Check out this colorful new Internet map (click the image to enlarge) from physicists at Tel-Aviv University in Israel and you’ll see what we mean. It’s a mathematical representation of the pipes, routers and other bits of hardware that ferry data across the Web. At the map’s red gooey center is a cluster of 100 networks operated by massive corporations like ATT Worldnet and Google. Its purple crunchy outer shell consists mostly of small ISPs. The trouble with being on the periphery is that your data must travel through the congested center, which is sort of like flying through O’Hare on your way from New York to Los Angeles. Basically, it’s really inefficient. The researchers don’t offer much in the way of solutions but say their model will help scientists better track the evolution of the Web, which in turn will help people innovate ways to make it less like a lollipop and more like, well, a superhighway. The link to the paper is broken. What are the size and color scales representing? 1. The Internet map comes from new data on the structure of the Internet, available at www.netdimes.org. Everybody are encouraged to visit our website and contribute some measurements to make the maps more accurate. The picture was generated with the Lanet-vi program of I. Alvarez-Hamelin et al. http://xavier.informatics.indiana.edu/lanet-vi. 2. 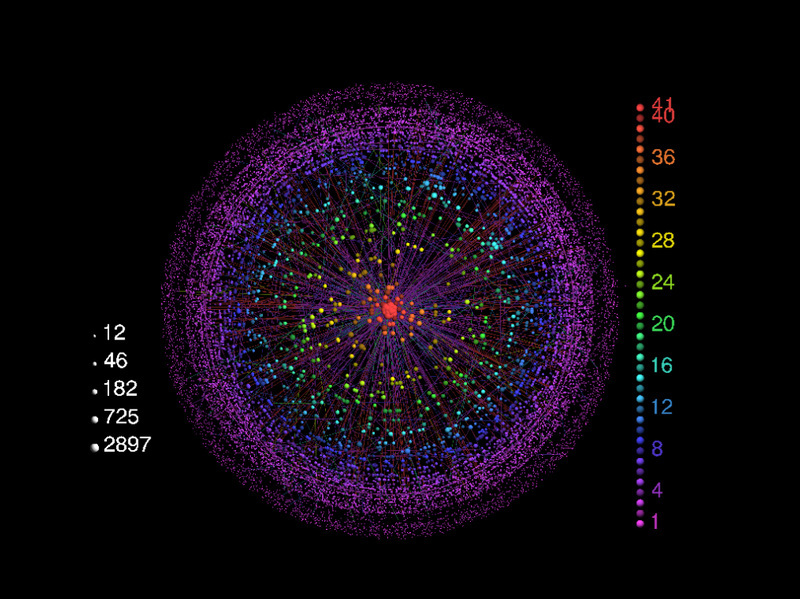 The color code is the k-index of a node, which is the number of links a node has to other nodes in the center of the network. The size of a node is proportional to the total number of connections it has. 3. Data is transferred between nodes of the Internet, and not websites. 4. The authors of the paper are physicists and engineers at Bar-Ilan, Tel-Aviv and the Hebrew Universities in Israel. "internet" and "web" are *not* synonymous- the Web is one of many services that run across the internet. The image is pretty, yet completely useless since you didn't label a damn thing. Like Axes, or even scale. Nice job nutjob. Actually the image is not useless, as it is a graph which doesn't need axes (neighbours are what are important). Sounds like we need a ringroad / bypass / expressway. I liked xkcd's map more. The internet is a moving target no matter how simple you try to make it diagramatically it is always changing. Hisenberg's uncertainty principle states that you can know the location or speed of an atomic particle not both. how many "clicks" does it take to get to the center of the internet ? Hey I thought I was the center of the universe and everything evolved around me including this mess!. i like blogs so much because Many blogs provide commentary or news on a particular subject; others function as more personal online diaries. A typical blog combines text, images, and links to other blogs, web pages, and other media related to its topic. The ability for readers to leave comments in an interactive format is an important part of many blogs. Most blogs are primarily textual, although some focus on art art blog, photographs photo blog, sketch blog, videos blog, music (MP3 blog), audio (podcasting) and are part of a wider network of social media. Micro-blogging is another type of blogging which consists of blogs with very short posts.